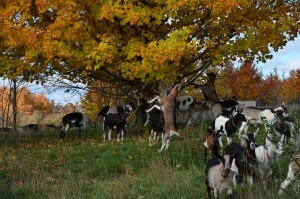 Idyll Farms goats are of the Alpine persuasion, a breed known for its highly nutritious and sweet milk. Their ancestors came from the French Alps, making them hardy and adaptable to Northern Michigan climate. Our goats have distinctive markings (along with having distinctive personalities!) that makes it easier to distinguish them from each other. Our does are bred every fall and give birth to one to three kids 150 days later. The kids are milk fed until they reach weaning age at about eight to ten weeks. Idyll Farms is a Certified Humane® farm, meaning that our animals are given more than adequate clean and comfortable space to live and the best food and treatment possible. Our herdsmen care for the goats as if they were their own “kids,” providing them with holistic and preventative health care, plenty of love and attention. 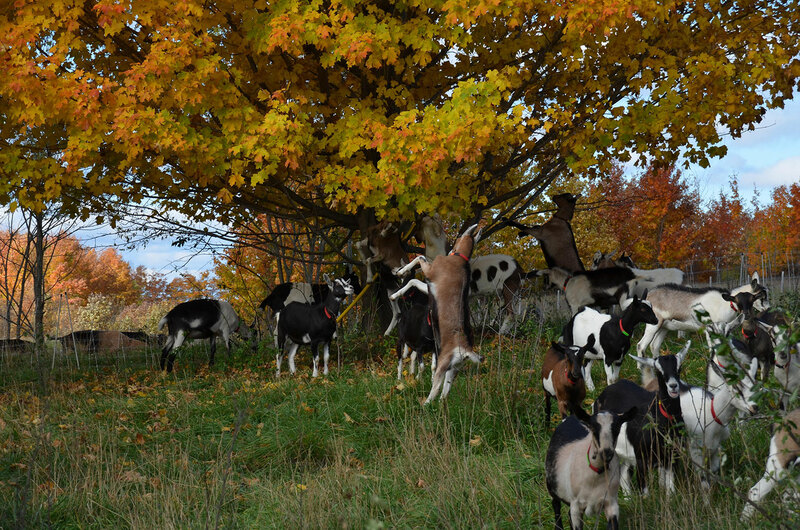 They carefully manage the rotational pastures, insuring the goats are grazing on the lushest and most nutritionally dense areas at any given time. Idyll Farms is swiftly on its way of becoming the largest pasture raised goat dairy in the country.